Dr. Petty’s site is aimed at patients who live active sport’s based lifestyles with all of the trials and injuries that come with it. Throughout it showcases not just his education and expertise with the needs of active patients, but also his personal experiences that give him first-hand knowledge of an athlete’s passions and life. The design is simple while remaining active and engaging, smoothly scrolling through his credentials and moving into the featured services of his office. Information is easily accessible for the patient seeking to become more informed about the resources at their physician’s disposal, as well as those who prefer to check the accreditation of their medical professionals. Contrast – As a visual element color should provide good contrast to improve the appearance of the site and aid in navigation. Red, white, and black are an excellent combination for this purpose given how well each contrasts with the other. Action Oriented – Red is a color that inspires action in the viewer, making it the obvious choice for the contact us section, as well as serving as the highlight for the Book Appointment hotlink at the top. It is also used for the footer text section for the same reason. Community Ties – You can use color to tie your site to your community and show your certifications. The colors selected for his site also represent the community he serves and his education, as the North Carolina State University’s colors are the same. With one subtle touch, he gains authenticity, reputability, and a hometown connection that is irreplaceable in site design. Like all of our designs, Dr. Petty’s site was created with attention being paid to some of the essential elements of web design, specifically including the following in this case. Space – The information Dr. Petty’s site is kept in a streamlined format without packing too much into one place, keeping the site clean and straightforward. Navigation – Navigating the website is as simple as scrolling for those looking for information about the Doctor and his credentials, and the services he provides. Clicking is reserved for those seeking more complete information about his services. About Us – This aspect of the site was virtually eliminated by including all the information about Dr. Petty on the home page. The “Meet Dr. Petty” page is essentially a stand-alone page containing the same information found on the home page for those who immediately check out the ‘About Us’ section on websites. Contact Information – The first information provided to the new viewer is the email and phone number for Dr. Petty’s office, as well as links to his social media streams on YouTube and Facebook. The information is provided three times in three different formats between the top of the page and the bottom, ensuring ease of access without additional unnecessary scrolling or clicking. 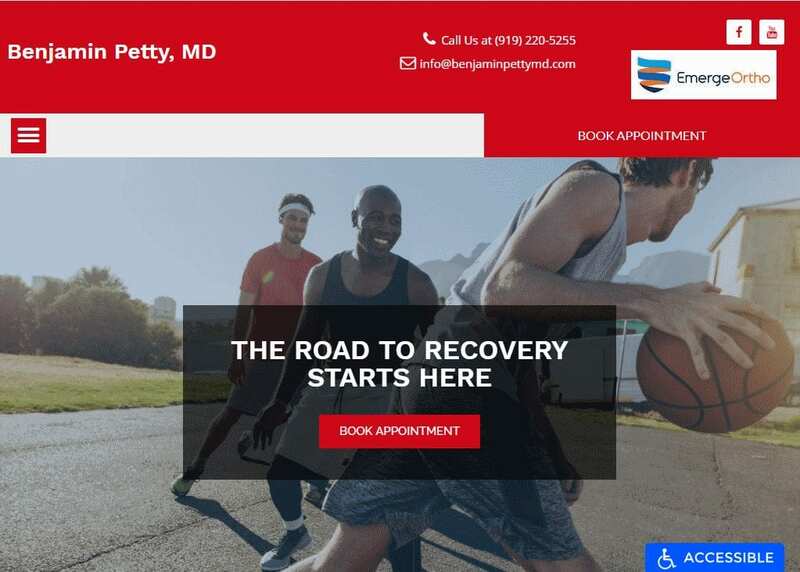 Informational Footer – The footer on Dr. Petty’s page includes links to all the areas of this site, including his services, locations, testimonials, and contact information. Also, information about his certification is included, and a quick-form for requesting an appointment. There are a few simple touches on this site that helps to increase its appeal and conversion rate among visitors. We can start by noting the absence of a navigation bar by implementing the three line menu button that’s become so prevalent in modern design. The rotating slideshow of images that greets the visitor helps to create rapport immediately by showing that this practice is focused on their concerns. Once you move away from the home screen and into the information pages, the site switches to a convenient and accessible card style design to streamline access to information in a way that prevents the viewer from becoming overwhelmed. This website demonstrates respect for the visitor’s interests and their need to keep on the move. Everything about this site’s design is focused on streamlined efficiency to make information accessible and to get the visitor on with their day after addressing their needs. Need to make an appointment? The information is right there at the top. Need to request an appointment so you can get back to your day? The link to “Book Appointment” is practically the first thing you see. These elements make this site perfect for clients whose customer base is active and on the go.